Time for things to go Barry-centric again! After a couple episodes focusing on other characters, I suppose we’re due for a more solid delve into the main character of the show and main villain of the season. But I am happy to say that The Flash seems to be keeping its good episode streak this week: while “O Come, All Ye Thankful” had a couple problems I’ll talk more about later, it certainly wasn’t a bad episode, and the West-Allen Family story we get makes up for a lot of faults in my eyes. It’s Thanksgiving in The Flash universe, which is fitting for an episode all about family relationships (adopted families or otherwise). 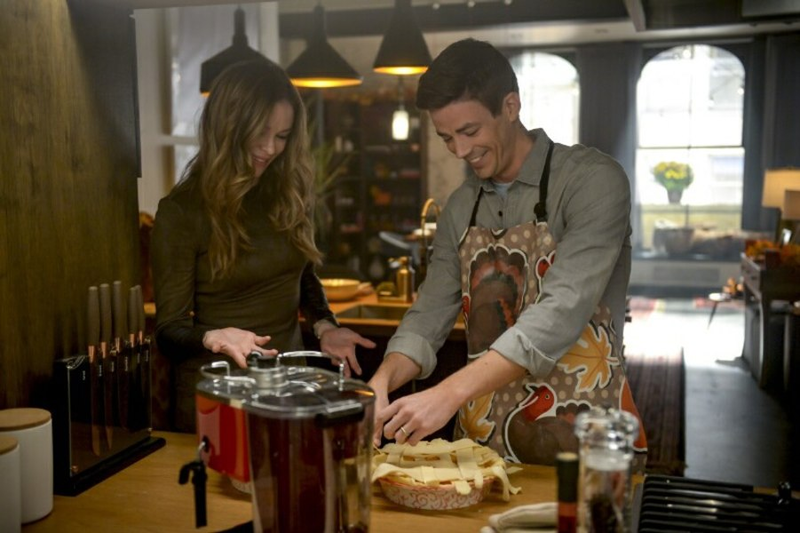 The episode begins with Barry and Caitlin making pie for the Team Flash Thanksgiving meal. It’s adorable, especially since Barry is awful at it and Caitlin tries to comfort him with puns. Kindred spirits, Caitlin and I. Anyway, Iris and Nora arrive from a mother-daughter day out getting manicures and it looks like their bond is still going pretty strong — a fact which I love and encourage. Unfortunately, the buzz of a nice day spent with her mom is snuffed out when Iris explains some stuff the Flash Museum in the future left out — mostly stuff involving Barry’s poor judgement and total lack of self-preservation instincts. Nora connects some dots and realizes that the reason why her hero father is missing in the future is because he was being a hero and, like walking into the Speed Force at the end of the show’s third season, sacrificed himself for the greater good. Yep. Sounds about right for our dumb, heroic Labradoodle. As Nora grapples with new information about her father’s motivations for leaving, a new meta arrives on the scene: Weather Witch, who wants to hold Central City hostage in exchange for her father, Weather Wizard. Her first strike against the city ends up with Barry dead and Nora trying to revive him with some shots of Speed Force lightning to the heart. Quick shout-out to Jessica Parker Kennedy, who plays Nora and delivers a perfect combination of desperation, fear, and horror as Nora attempts to revive Barry — and relief, fear, and horror when the attempts finally succeed. It’s a moment that really nails down exactly what motivates Nora throughout the episode, and why — even though she’s a hero herself and knows what that role entails — she asks Barry to hang up the Flash costume and just be her dad. Like I said, Weather Witch is looking for her dad, who’s currently locked up in Iron Heights. Team Flash initially thinks she wants to save her dad from prison, but it turns out she wants to kill him for being a deadbeat all her life. Wow. Extreme. Anyway, how wonderfully coincidental that Weather Witch, a former amateur storm chaser, managed to get one of her weather devices infected with dark matter-infused satellite parts and gained powers like her dad’s. Guess life’s just funny that way. Superpowers-related question, though: how is Joss not killed by her own lightning tornadoes? The staff she uses has metapowers. She’s just a normal human; she shouldn’t be immune to lightning. After her attempts to kill her father are thwarted, Weather Witch decides it’s time to threaten a whole airport full of people and, eventually, all of Central City unless Team Flash serves Weather Wizard up for her to kill. Barry goes to the airport, but he needs Weather Wizard’s wand to counteract Weather Witch’s powers. Nora speeds the wand to Barry, who must risk his own life in the lightning storm if they have any chance of saving all the people still trapped at the airport. Nora looks at her dad, then looks at all the scared citizens, and realizes that being a hero has to mean taking risks and that Barry is the sort of person who would always choose saving others over saving himself. When Weather Witch is behind bars, Team Flash gets to celebrate Thanksgiving together. Cisco, Sherloque, and Caitlin all need a little convincing to join the party, since they all had a bad year — or, in Caitlin’s case, bad several years. Seriously, Caitlin I am so sorry the writers are so mean to you. Thankfully (ha!) Killer Frost is now available to snark some sense into them, so they go and celebrate with the others as one big, happy, makeshift family. Thanksgiving also inspires Cisco in the quest to find out Cicada’s identity. Since they know the victim connected to Cicada is a girl named Grace Gibbons, who doesn’t have any family on record (thanks to the mysterious pro-Cicada doctor), Cisco still figures any family she might have will likely visit on Thanksgiving Day. He hacks into the hospital security and sees Cicada himself arrive at Grace’s room and identifies the man as Orlin Dwyer. Who is Orlin Dwyer, though? A series of flashbacks throughout the episode tell us he was once a selfish, self-loathing man whose niece, Grace, was dropped off at his apartment after his sister was killed in a metahuman attack. Orlin is initially terrible to Grace and such an awful guardian that I question the efficacy Child Protective Services in Central City. They seriously just drop kids off at the nearest relative’s house without determining if that person is in any way equipped to take care of a child first? Jeez, guys. Run a background check, will you? Life is tough-going for Grace and Orlin while Orlin utterly fails to be a respectable adult and Grace gets reprimanded by school authority for calling kids rude words she learned from Orlin. After Grace correctly surmises that Orlin hates himself and that’s why he’s such an awful, angry person, Orlin begins trying to make things better for her and them, as a family. He gets a fixer-upper house and even gets her a dollhouse they can build and decorate together. A year after Grace arrived in Orlin’s life, they’re at the carnival together and are ready to be a family. Unfortunately, the Enlightenment happens. Grace is knocked out by debris and Orlin gets a huge hunk of metal to the chest, which he leaves in until he can deliver an unconscious Grace to the hospital. Dr. Mysteriously Very Helpful takes uncle and niece in, but while she can help the former, the latter’s fate is unknown. The doctor expresses how Grace getting hurt is really the fault of metahumans, which pushes Orlin to officially become Cicada. And the shrapnel he’d been impaled with becomes his dagger. Now, I really do like this little backstory we get for Cicada, especially since the show established from the start how empathetic the character is toward people with strong family connections. The flashbacks work to reinforce that, explain his connection with Grace, and explain why he blames metahumans for his troubles. However, I think the show might have rushed through all those explanations a bit by putting them all in the same episode. Personally speaking, I would have found the “learning to be a family” story more compelling if Orlin and Grace’s relationship was extended over flashbacks in several episodes, and I would have found Cicada’s motivations against metas more believable if he’d... y’know, mentioned hating metas at any other point before the doctor brings it up? Orlin’s sister was killed by a meta, but that gets one blink-and-you’ll-miss-it mention, and then nothing. As it stands, Cicada’s motivation seems more like an attempt to blame literally anything for Grace’s injuries, so he latches onto the first option given to him. While emotionally sound, it’s a narratively weak origin for a metahuman serial killer. The music in some of the scenes this episode stood out as particularly great, especially the drum-based music before Barry’s confrontation of Weather Witch. Next week: The Flash’s 100th episode!